What is a California "certified" legal specialist? 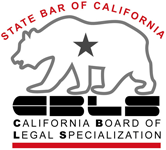 Which areas does the California Board of Legal Specialization certify directly? The State Bar's Legal Specialist Search will direct you to a list of specialty areas that are certified either by the State Bar or an organization accredited by the State Bar. The State Bar of California's Board of Legal Specialization also accredits the following organizations, which certify attorneys in additional practice areas. These attorneys are also listed in the bar's specialist search database.